The Golden Fleece is variously a remnant from Greek mythology, a reference to an ancient gold mining technique, or an Australian Oil Company which was purchased by a multinational brand around thirty years ago and therefore passed into mythology as well. 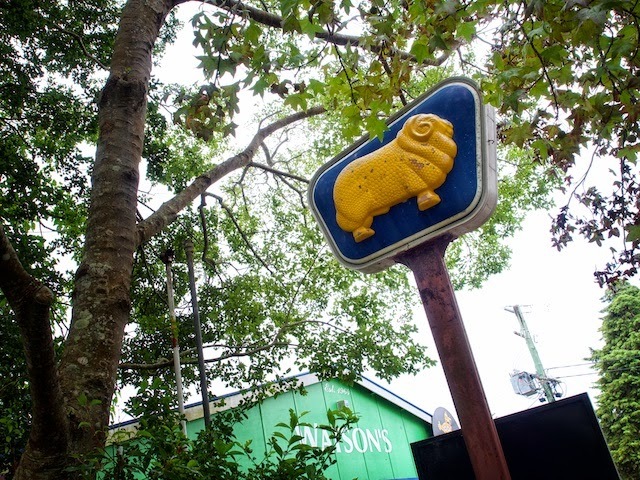 This petrol station standard in Maleny is preserved for posterity at Watson's Garage (established 1964), and could be the only one still standing in its original environment. While it has featured on this blog once before, that was five years ago and well, one would have to do a search! This post is one of many on the theme "Curiosities" to see more of the City Daily Photo Community interpretations please visit our Theme Day Gallery. Nicely chosen for the theme. The Golden Fleece was a favourite story of Greek mythology for me. He's a cute little fellow. Love your text, made me smile. I love finding and photographing old signs, remnants of the past. I love finding the old commercial signs like that one! Interesting history to this cute sign. Great to see this sign again after all these years.